Apologies to the girls as the Pursuit result should have been 1st Karen; 2nd Jess and 3rd Ellen (with Newton). It was good to see another new sailor joining the racing fleet, so welcome to Jess Bertram for her first race at RSC. With a NE wind of 10mph forecast to rise to 13 mph James used an Island start with a first beat to X (about hallway between 5 and 6, but in the middle of the lake), then 5p, 8s, 4p, 3p, 2p and back through the start. There were 23 starters for this race and after one lap early starter William P (Topper) was still leading from his fellow Topper sailor Ben H. Gordon P (Mirror) came through in 3rd with John C (Topaz) 4th being caught by Jess B(Radial) who had just passed Chris A (Solo). By the second lap Karen (Laser) had come to the front and Jess had moved up to 2nd with Richard S (Laser) 3rd, Ellen & Newton (RS200 4th, Mark B (Laser) 5th and Jon (Laser) 6th. At the gun these first six boats had maintained their positions. There was an interesting incident just before the finish gun when Chris A fouled the mark and started to do his penalty turn just as the gun went and just as he collided with Mike A coming up to the mark. The question is whether you have to do penalty turns after the finish gun has sounded in a pursuit race and how would you decide finishing positions? Would be interested to hear from anyone who knows the answer! Dave I (Radial) and John C decided to sit this one out as usual, but the appearance of David C and Richard H, both in Lasers meant that the field remained at 23 for the second race of the day. David C led at the end of the first lap followed closely by Jon C and this was to be the pattern for the whole of the race. Karen came through in 3rd with Mark 4th, Newton & Ellen 5th and Adrian (Rooster) 6th. There was a peculiar collision between Peter R (Enterprise) and Dave & Ann L (Leader) on the way down to No 8. It looked as if the boats had contracted Spring fever and had started to perform a graceful courtship dance locked together and pirouetting around one another! Peter retired after this unfortunate coupling, not sure if he suffered some damage or could not stand the passion ! At the end of the second lap the only change in the leading boats was Newton & Ellen taking 4th place form Mark. There was a packed midfield of Lasers enjoying some close sailing, but the slower boats of Chris A (Solo), Mike A (Lightning) and Chris H (Comet) were getting left behind in the freshening breeze. By the third lap Adrian had moved up to 4th pushing Mark down to 6th and Richards S had gained three places to move up to 7th just in front of Jess in 8th. In the middle of the fleet, the Lasers of Rod, John H and Dave P were having a good battle with Paul H (Supernova) for 9th to 12th places. Not far behind them there was another good tussle between Steve P (Laser) and Rick (Laser) and then slightly further back Richard H and Gareth D, both in Lasers, were having their own battle.. Dave & Ann had to retire as their Leader had obviously over-exerted itself in the dancing and could not take any more! At the end of the fourth lap the leading boats had shuffled position slightly with Adrian moving up another place to 3rd and Richard up two places to 5th. John H had gained two places to move up to 8th, but Rod and Jess crossed the line together in joint 9th. The only other mover was Paul H who gained a place to move to 11th. William and Ben who had been having a good battle in their Toppers received the gun at the end of this lap with William just coming out on top. The last and fifth lap saw no change in the first four, but Newton & Ellen managed to get past Richard and Mark to move up to 5th. Jess had managed to shake off Rod and get past John H to move up to 8th and Steve P had got the better of Dave P and Rick to move up to 12th, but there were no other changes in position. On handicap Jess in her Radial should take 3rd place with Adrian dropping out of the top six. Thanks to James and the OOD team of Dean & Nick J, Chris S and John W.
With a light 6 mph N wind Roland S used an Island start with a first beat to 5, down to 6s, 9s, 4p, 2p and back through the start. There were 15 starters including Edward in his Topper and Jemima in her Oppie. Karen (Laser) was first back through the start followed by Newton (Solo) and then going well were Sally & Stuart (Leader) in 3rd Julian W (Solo) was 4th but only just ahead of Mark B (Enterprise), then there was a gap back to a gaggle of boats led by Paul H (Supernova). In the Juniors Edward led Jemima and she receive the finish gun at the end of the first lap. At the end of the second lap the first three boats were the same but Dean & Nick (Vago) had moved up to 4th. Rod (Laser) had gained one place to move to 7th, Mike T (Laser)had gained two places to 9th and Chris A (Solo) one place to 11th and bringing up the rear were Rick (Laser) and Dave & Ann (Leader). Edward received the finish gun at the end of this lap. The third and last lap saw Karen finish well ahead of the fleet with Newton still in 2nd place. Mark had moved through to 3rd and Julian had retaken Dean & Nick for 4th place. Paul H had moved up two places to 6th, Mike A (Lightning) was up three places to 7th and Chris A up another place to 10th. The rest of the fleet had either maintained their position or lost ground. Unfortunately Sally & Stuart after being 3rd for most of the race had a disastrous last lap and slipped down to 11th ! 1st Karen; 2nd Newton; 3rd Mark; 4th Julian W; 5th Dean & Nick; 6th Paul H.
On handicap the first two should keep their places but Julian will push Mark down to 4th and Mike A and Chris A should move up to 5th and 6th respectively. In the Junior Series Edward will get a 1st and Jemima a 2nd. Thanks to Roland & Ryan S and the OOD team of Carol & Chris M, Jeremy, David M and Gary B. 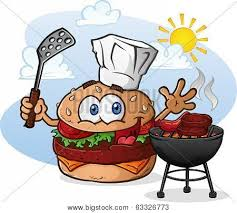 Back by popular demand, the BBQ series will start again on Sunday 29th May at 14:00 ish. The format will be the same as last year, fun informal racing youths and juniors (but big kids are welcome as well), but around a theme of a famous sailing race. The first in the series will be “Round the Island”. Not sure that the weather is going to play along, but on the off chance it does, why not make an afternoon of it and bring along your own BBQ? It was a similar morning to last Sunday with a light wind which kept veering and changing in strength. At the start it was about 5 mph from the NW, but did not actually stay that way throughout the race! Ian had difficulty in setting a start line because of the variable wind, but settled for an Island start with X as the first mark, positioned about midway between 5 and 4 on the buoy line, then 4p, 2p, 1p and back through the start line. Dave & Ann L decided to give an outing to their recently acquired Leader. There were 17 starters and most of them arrived at the first mark at about the same time, which resulted in an interesting traffic jam. The more wily stayed wide and went round the outside avoiding the raft. The wind was so light that most of the fleet had not finished one lap when the finish gun went. The order at this point was 1st Richard S (Laser), 2nd Karen (Laser), 3rd Hadey (4.7), 4th Mike A (Lightning), 5th Peter R (Enterprise), 6th James (Laser). Dave I (Radial), Peter R, James P and Alistair S (Laser) could not stand further excitement and settled for a cup of tea, but Roland & Ryan (National 12) and David C (Laser) decided to join in the fun. At the end of the first lap it was a Laser clean sweep at the front with 1st David C, 2nd Karen and 3rd Richard S. Adrian (Rooster) was next followed by Dean & Nick (Vago) and Mike A.
David still led after the second lap, but Richard and Adrian had managed to get past Karen. Roland & Ryan had moved up three places to 5th and Chris A (Solo), Chris H (Comet) and Rick L (Laser) had all gained a place due to the retirement of John C (Topaz). There were no changes in position on the third lap and Hadey, Rick, Gareth (Radial) and Dave & Ann received the finish gun at the end of this lap. At the final lap David led across the line, but Adrian and Karen had managed to get past Richard to take 2nd and 3rd places and Jon (Laser) had got past Dean & Nick to move up to 6th and Chris A had moved up one place to 8th. 1st David; 2nd Adrian; 3rd Karen; 4th Richard; 5th Roland & Ryan; 6th Jon. On Handicap David will still be 1st, but Karen and Richard should leapfrog Adrian with the other positions unchanged. Thanks to Ian C and the OOD Team of Catherine B, David M, Mike T, Julian W, Stephen and Oscar. The forecast was for a 10 mph West wind with some rain. In the event just before the start there was an absolute deluge and the rain was so heavy you could not see the far end of the lake! Fortunately at the start the rain had abated somewhat but the wind had turned through 90°. Karen set a figure of eight course, 4p, 9p, 6s, 7s and back through the start. There were only 10 starters and Ian (Supernova) pulled out a useful lead on the first lap with Curtis (Laser) 2nd and Newton (Solo) 3rd with the Lasers of Hugh and Rick next. These five were pulling away from the back five, which were led by Chris A (Solo) followed by Mike A (Lightning), Dean & Nick (Vago), Sally and Mike C (Leader) with Paul H (Supernova) bringing up the rear. At the end of the second lap the first five came through in the same order and they had pulled even further away from back five. Dean & Nick had gained two places to move up to 6th and Sally & Mike C and Paul H had gained a place to move up to 8th and 9th. At the end of the third and last lap the first six maintained position, but Paul had gained two places to 7th and Chris A had regained a place to finish 9th. 1st Ian; 2nd;Curtis; 3rd Newton; 4th Hugh, 5th Rick; 6th Dean & Nick. On handicap Newton will leapfrog Curtis to take 2nd and Sally & Mike C will push Dean & Nick out of 6th spot. Thanks to Karen and the OOD team of Helene, Jessica, Chris H, Chris and Stuart. Contrary to what it says on the Club Calender there will be no BBQ series race this coming Sunday afternoon. We will kick of the series the following Sunday, please see the website for more details nearer the time. The forecast was for a NW about 7 mph, but in reality the wind kept veering and then picking up and then dropping again. This made Rod’s job of setting a start line and a course quite tricky. In the end he settled for a normal flagpole start but brought the pin down to just above 7 with a first beat to X on the buoy line then 8s,5p,9s, 4s, 6s, 7s. Welcome to Josephine and Chris K who were joining us for their first races at RSC and welcome back to Andy B who teamed up with Steve P in the galleon (505). There were 25 starters for the Pursuit Race and in the absence of any Oppies or Toppers, Josephine led off the line in a Pico followed by John C (Topaz), Chris H (Comet) and Hadey (4.7).However although the wind was fickle there was enough of it around to allow the later starting fast boats to come through and Julian B (OK) led at the end of the first lap followed by Karen (Laser) and Ian (Supernova). Chris H was still hanging on to 4th, but being caught by Richard S and David C in their Lasers. At the finish gun the first three, Julian, Karen and Ian were in the same positions, but David C had moved up to 4th with Richard 5th and Ellen & Newton (RS200) 6th. Dave I (Radial), Julian W (Solo) and John C decided to sit this one out so the field was down to 22 for the second race of the day. At the end of the first lap Ian led from Julian B followed by Richard S, Newton & Ellen, Karen and Hugh (Laser). Adrian (Rooster) was just ahead of David C and Dave L (Laser) who had the 505 breathing down his neck. Towards the back of the fleet there were the six boats of Mike A (Lightning), Rick (Laser),Dean & Nick (Vago), Hadey (4.7), Chris A (Solo), Alistair S (Laser) battling away. This lot enjoyed themselves for the three laps of the race constantly swapping places, but never looking like catching any of the fleet ahead of them ! Stuck between the two fleets was Chris K (Radial) in a lonely 14th place and bringing up the rear were Gareth (Radial) and Josephine (Pico). Julian B retired on the second lap, but not sure of the reason, unless he was finding it too easy ! Mark B who was out solo in his Enterprise also retired after the first lap (too many ropes for too few hands). Ian still led but Richard moved up to 2nd with Julian’s retirement. David C had moved up three places to 4th, Steve P & Andy B were up two places to 7th and James (Laser) was up three places to 9th. In the second fleet it was difficult to know who was doing what, although Chris A seemed to be coming further forwards. At the gun Ian had established a clear lead to cross the line in 1st place, but Newton & Ellen had just squeezed past Richard S to take 2nd from him. The other movers on the last lap were Adrian (Rooster) and Steve P & Andy B (505) up one place to 5th and 6th respectively, James was up another place to 8th and Chris A up two places to 12th. 1st Ian; 2nd Newton & Ellen; 3rd Richard S; 4th David C; 5th Adrian; 6th Steve P & Andy B. Thanks to Rod and the OOD Team of Rachel, John W, John H and Simon. With a NW wind, about 7 mph, Mark B set a good course with an Island Start using Xp, 5p, 2s, 4s and back through the start, which ensured that there were no dead spots in spite of the light wind. There were 15 starters and Karen (Laser) got a cracking start and led at the end of the first lap, but not by much from Newton (Solo). Curtis (Laser) came through in 3rd some way ahead of the rest of the fleet who were having a real tussle and this continued the whole of the race with places changing considerably lap by lap. At the back of the fleet there was a good Topper battle between Edward, Joe and William and Jemima was gamely bringing up the rear in her Oppie and she received the finish gun at the end of the lap. The first three were unchanged at the end of the second lap and there was a large gap back to the rest who were led by Chris A (Solo) who had moved up from 11th to 4th with Richard H (Laser) 5th, Mike A (Lightning) 6th, Hugh & Joachim (Leader) 7th, Ellen (Radial) 8th, Paul H (Supernova) 9th, Dean & Nick (Vago) 10th and Mike T (Laser) 11th, but you could throw a blanket over all of them. Edward still led the Topper Trio, but William had managed to get past Joe. The third lap saw no change at the front but Richard H had come up to 4th and was pulling out a slight lead on the rest of the pack. Paul H was up three places to 6th, Ellen was up one place to 7th and Mike T up three places to 8th. The double handers were having a good battle with Hugh & Joachim just holding off Dean & Nick. The Toppers received the gun at the end of this lap and William had managed to get past Edward with Joe coming in third. On the fourth and last lap there was no change in position amongst the first eight boats, but Chris A had made back two places to 9th and Dean & Nick had managed to get past Hugh & Joachim. 1st Karen; 2nd Newton; 3rd Curtis; 4th Richard H; 5th Mike A; 6th Paul H.
On handicap Newton should take the win from Karen and Mike A leapfrog Richard to take 4th and Ellen to take 6th from Paul. Thanks to Mark B and the OOD team of Adrian, Andy, Jeremy, Martin and Rick. Look out for the photo of Karen giving Jemima a tow back to shore at the end of the race – that’s the girls for you -not like the blokes racing back to try and get first out of the water ! After a fantastic race in her Oppie Jemima hitches a ride back to the pontoon!! !